Each year, hundreds of thousands of motorcyclists head toward what many feel is the motorcycling mecca of the world, Sturgis, and the Sturgis Motorcycle Rally. The Sturgis Motorcycle Rally in South Dakota takes place this year August 9-15. Check out my article on this great motorcycle rally. 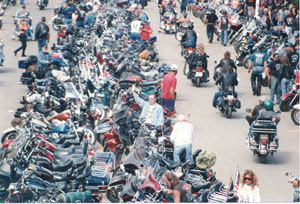 See if you can see me waving in the picture when I attended the 1993 Sturgis Motorcycle Rally. I really need to go back to this great rally. How about you?